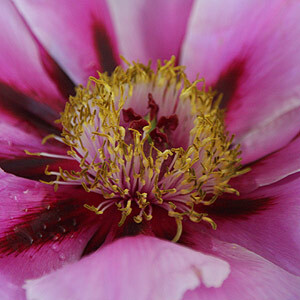 Paeonia suffruticosa is the name used for what we commonly called the Tree Peony. They are hybrids and come in a dazzling number of flower colours. 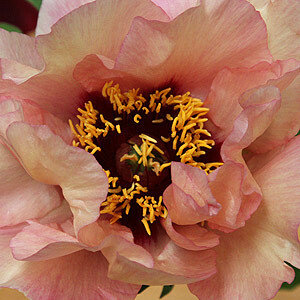 You will see some sold as Chinese Tree Peonies, and these are the ones hybridised in China. The tree peony is so named because it has a woody stem, it forms a small deciduous shrub and the structure remains year round. The flowers differ, perhaps best described as larger and flatter. The foliage is not as glossy as other peonies, however, more flowers and more colourful ones at that make up for any shortcomings. They form the buds for next years flowers on these above ground stems and pruning is limited to essential shaping only, however as they are slow growers and keep a small shape this is not a problem. The bark of these stems is used in Chinese medicine. They have been grown in Japan after introduction from China since the eighth century however they took another 1000 years to get to europe. The name Moutan peony comes from the Chinese, Mu Dan Pi, where the root bark is used in traditional medicine. Foliage is green and ferny,very attractive from spring right through summer. However it is the flowers that these plants are grown for. Large colourful and like silk. some with fragrance others without. For tough hard conditions it is hard to beat Tree Peonies. They are in active growth from autumn through to spring and when summer comes around, they are still in full foliage, yet have ‘Shut Down’. Knowing how to plant peonies involves a few steps, understanding the growth cycle is what makes these plants so easy to grow. The roots systems spring into life well before winter, in fact just as summer comes to an end with the first rains. In late winter to spring the new shoots appear, foliage and flowers. And here is the added benefit, the foliage will stay right through summer and they do need watering over this period. So beautiful drought tolerant tree peonies are are also drought tolerant.The main trick to growing these free flowering plants is to find a sunny position and soil that is on the alkaline side. You can easily add some lime to remedy acid type soils. You should prepare the soil well in advance, add lots of compost, aged cow manure and even some bone meal. Peonies do not like to be disturbed, so choose a permanent position. The best time to plant then is just after summer, prepare the soil, plant the Tree Peony and water in well with a liquid seaweed fertiliser. Most varieties will reach around 3 ft (1 metre) in height and 3 ft (1 metre) so give them the space to grow into. At this size, you can grow them even in small gardens. They can be slow growing to start with and may not even flower for 2 - 3 years. A position in full morning sun and a little afternoon shade is ideal. Adjust the pH of the soil if needed. Prepare the soil well with compost and cow manure. Remove the plant from the container, squeezing and tapping so as not to disturb the root system. Do not tease out the roots, leave them undisturbed. Plant at the correct level, same as in the container. Water occasionally though the first summer. At the end of summer, as the first rains come, apply a top dressing of manure. You can also use some pelletised chicken manure in early winter. You can also plant in spring, however you will need to water regularly from planting through summer. A good deep watering every 8 - 10 days should be adequate. Where can you grow tree peonies ? They are regarded as hard in USDA Hardiness Zones 4 to 7. You can grow them in zones 8 - 9 however you will need to change the planting position to afternoon shade, you will also need to water in dry spring periods and even over summer. Mulch around the plants will also help in extreme heat. In these areas look for Paeonia rockii cultivars as they seem to be the hardiest. So we have Japanese, French, Chinese and English names, some a reflection on where they were bred, others just renamed. Easy to prune and best done in late winter tree peonies are pruned in two stages. Step One : prune away any dead wood or stems. These will include some that high on the plant that need to be pruned back to live wood. You will also find some stems that have died right back to the ground, these need to be cut to ground level. Step Two : look closely at the remaining stems and check for dead buds near the tips of the stems. You need to prune back to a live bud. Tree peonies are readily available for sale and are very popular in the following states: Washington, Wisconsin, Oregon, Connecticut, Indiana, Iowa, Massachusetts, Pennsylvania, Maryland and District of Columbia.